I feel like posting a vampire story. 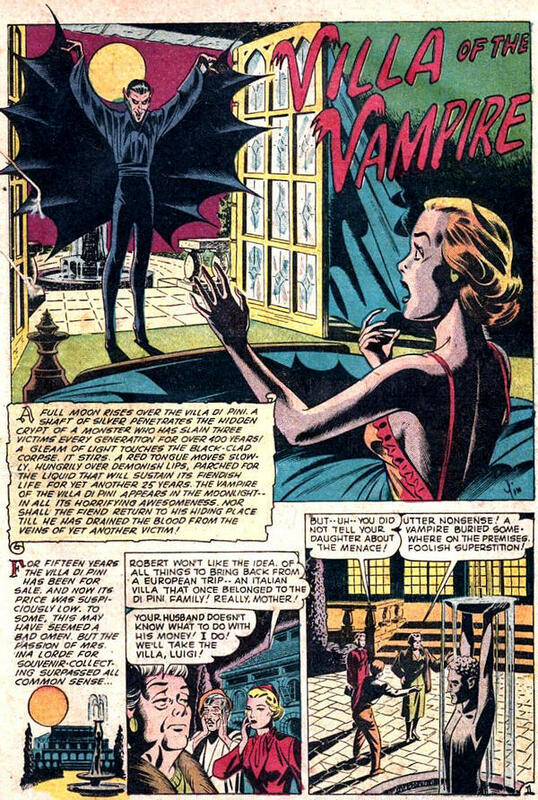 It's the end of August and I just got my property tax notice for this year, so a bloodsucking vampire story, "Villa of the Vampire," seems appropriate. In the recession the value of my own "villa" has gone down, but my taxes have gone up. 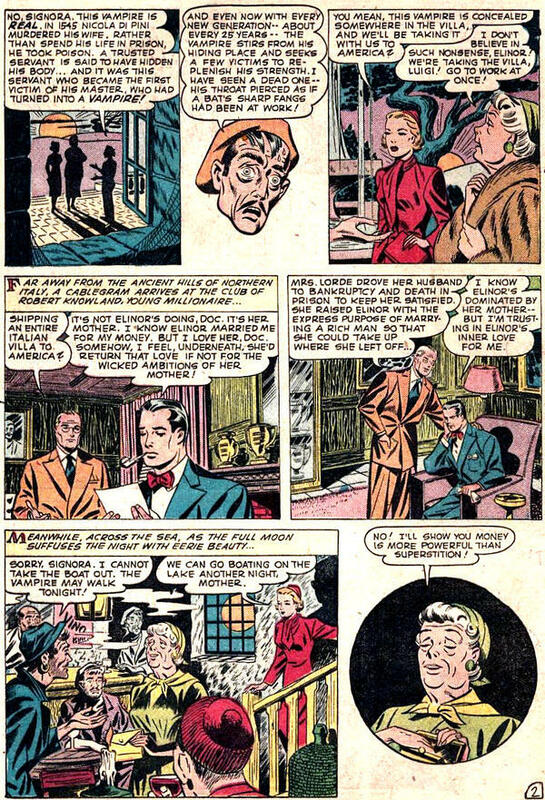 The story is from the one-and-only issue of Challenge Of the Unknown (not Challengers Of the Unknown, an entirely different comic), published by Ace in 1951. 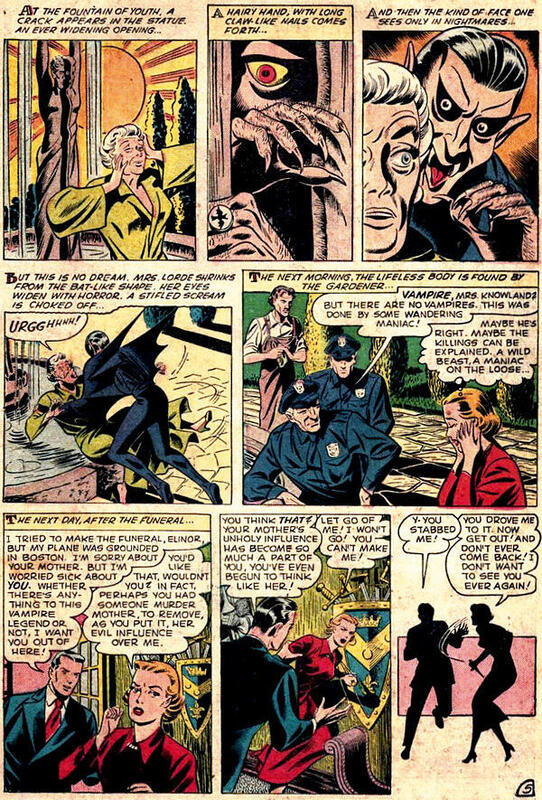 As pointed out by reader Charles of the South in the comments section for this post, the artwork is by Lin Streeter, and as pointed out by Karswell, the name Lin is in the lower right corner of the splash. I like the vampire's gimmick. I apologize for lauching at your stated reason for running this vampire tale, Pappy, but it struck me as funny. I guess that I can feel your pain on the taxes. It doesn't make good sense to have to continue to pay taxes on something like a home after you've "earned it" by paying off the mortgage. This was a terrific story to run in honor of the great leech effect. No apologies necessary, Chuck. Your laughter counteracts my tears. As I've been reminded, unlike people who've lost their homes I've still got mine. So I should just count my blessings and shut up, huh? I consider your support one of my blessings, Chuck, ol' buddy. You're one of the real good guys. I've been willing to congratulate you for a long time... but laziness keot me out of it, I guess... Oh, well, I think your site is pure joy for us veteran classic comics lovers... By the way, the artist of this "bloodsucking" yarn is by no means "annonymous": his name is Lin Streeter, as I learned quite recently, and I consider him one of my favorites. I'll be following your posts... They amuse me a lot. Glad you posted this one Pappy, I've been wondering what this Challenge Of the Unknown issue was like and it's a cool story! Is the rest of the issue good? And yeah, Lin Streeter for sure, you can even see his signature "Lin" in the splash. 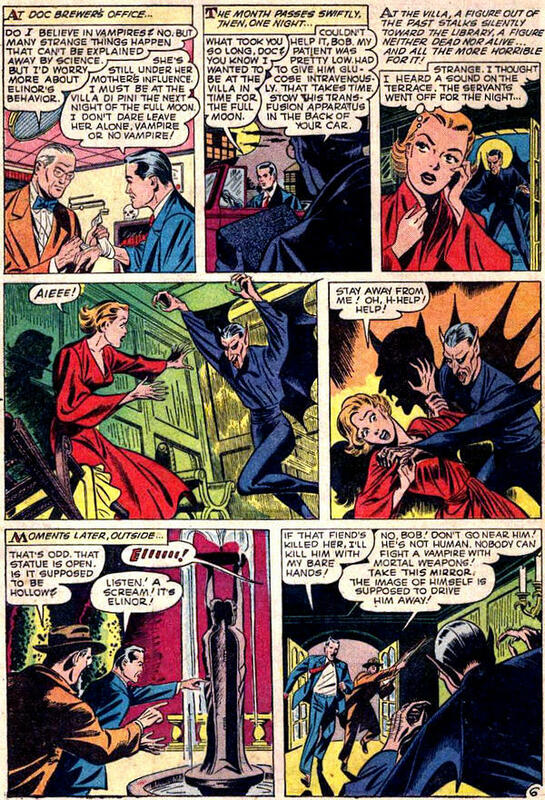 He's one of my favorites too, I've posted alot of his pre-code stuff from ACG over the last few years. Good gawd! 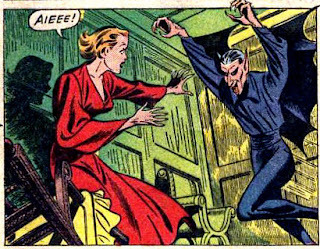 When I saw the first panel of "Villa of the Vampire," it was like a jolt from the past. I remember having this comic. (the "one-and-only issue of Challenge of the Unknown" per Pappy's note). Scared the crap out of me, being a wee lad of only 8 y.o. back in 1951. 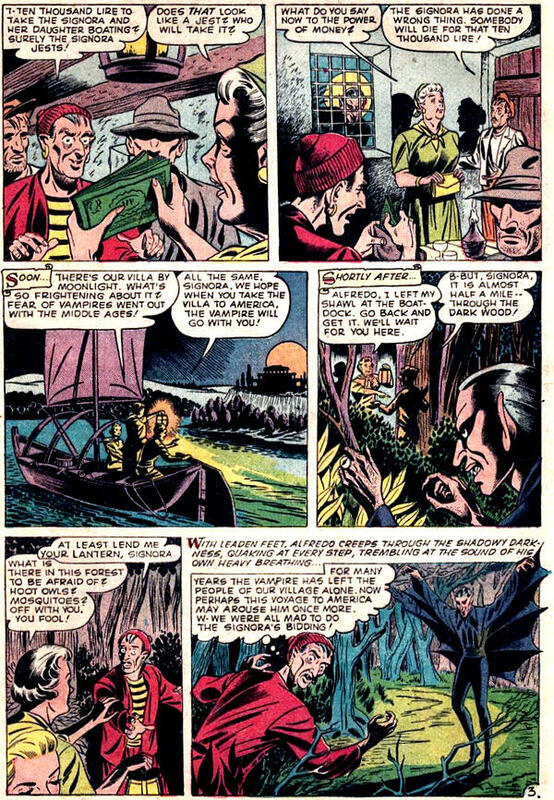 And, yeah, Pappy, the vampire did have a clever "gimmick" - concealing himself in the Fountain of Youth so he could live century after century. Another gem! Keep up the good work! OK, Lin Streeter, and now I can see his sig in the corner of the splash. Thanks, Charles, for the information. I'll go back into the body of copy and edit it to reflect that. 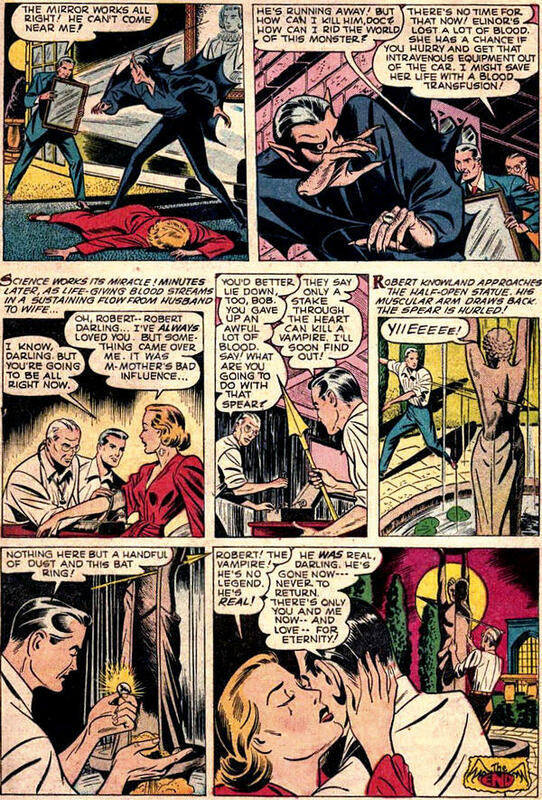 Karswell, Challenge of the Unknown is typical of the Ace Comics we're familiar with. 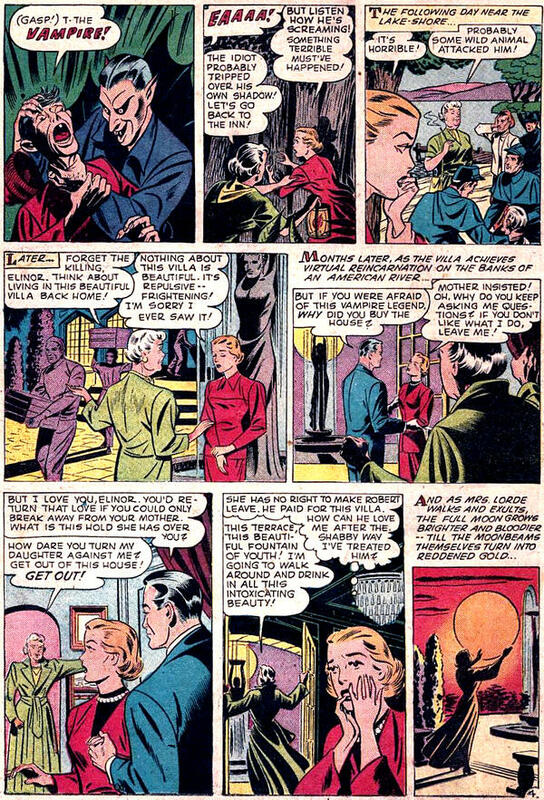 I think some, if not all, of the stories were reprinted later so you may have seen them: "High Priestess of the Snake People," "The Ghost in the Portrait," and "No Grave to Hold Him" in addition to the Lin Streeter story shown in this post.